Note: This story was previously featured on the front page of the Saturday edition of the Observer-Reporter in Washington, PA on July 15. Due to archiving limitations, this story is no longer available at the observer-reporter.com and has been republished here with permission. All photos taken by Nate Doughty. CLAYSVILLE – Mel Blount is not the average retired four-time Super Bowl Champion and former Pittsburgh Steeler. On Friday, the professional athlete and pro football hall of famer hosted his third annual youth camp at his residence, where over 250 kids and more than 100 volunteers from around Western Pennsylvania came together for an event centered around health, wellness and education. "A lot of these kids come from depressed neighborhoods, dysfunction families, single parent homes – you name it," Blount said. "Our mission is to reinforce positive thoughts, positive experiences into these kid's lives and let them know that they can take that and be anything they want to be in life." The daylong event was kicked off with a speech from Dwan Walker, the first African American mayor of Aliquippa. The campers were then sectioned off into three groups for the educational sessions. In the healthy relationships and parent/child conflict session, Prevention Specialist Matthew Salih of Three Rivers Youth taught campers the importance of building long lasting connections with other people. Matthew Salih, right, a prevention specialist with Three Rivers Youth, highlights the importance of healthy relationships during the 2017 Youth Summit at Mel Blount’s home on July 14, 2017. "It's a great way to get kids to really start thinking," Salih said. "Relationships aren't like some instant pancake mix. A lot goes into it and there're always changing, and if you aren't operating on the right principals, then your relationships are going to break down." Throughout the academic school year, Salih travels to an average of five schools a week to help children that are facing drug and alcohol issues or behavior problems. He meets with school administrators and counselors to adapt the lessons to fit the issues students in the area might be facing. Salih then organizes and puts on presentations that explain the benefits to healthy relationships. He also discusses identity, conflict resolution and personal growth and development. Following this, students are broken up into groups or he meets with them one-on-one to discuss what was learned. "I try to get them to see the brighter side of things," Salid said. "I'm trying to kind of graduate them to be more critically minded, critical thinking, instead of being so instinctual and impulsive." Salih works with students as young as six and said he feels fulfilled at the end of every day by helping them. At the youth camp this year, Salih spoke about healthy relationships and how kids can see the signs of good and bad ones. At the violence and education session, Chris McAneny, the founder and executive director of 3ENOW, taught campers the different reasons why people perform violent acts and how they can be prevented. "Violence is learned," McAneny said. "You can deconstruct power and control systems and look for better ways for managing three and a half billion people on this planet without the use of control of prejudice, racism or sexism that often are the seeds of violence." His organization, founded in 2010, explores ways of combatting violence through different scenarios that people might encounter in their life. The programs, found in Alleghany county and throughout western PA, focus on preventative measures people can make before they would ever think to respond in a violent way. "One of the critical messages I say is that if you're waiting around for the adults to fix the problems in the world, you're going to be my age one day and giving the same message to your kids," McAneny said. "You don’t need a master's degree to start changing the world or your community. What you need to do is find confidence in your voice and carry your peers." During his lesson, McAneny explained the positive influences kids can have on one another and how they can show positive change in society on their own. His said that something as simple as calling someone out when they say something inappropriate in the locker room can have lasting positive impacts on all of those involved. Angela Terenzio ran the health, wellness and trauma session where she highlighted the importance of the types of effects that different traumatic events can have on someone's life. "It's' different for every person that experiences it," Terenzio said. "It's important to talk about wellness and how to take care of yourself." Terenzio is a clinical coordinator with Second Chance, an organization that provides kinship care to children who are in the care of relatives or close family friends. She spoke about the effects of trauma and how it can impact mental health. During Terenizio's session, campers made a self-care plan that had them list items that positively impacted their mind, body and spirit as well as a place where they could write down supporting people in life and goals that they wanted to accomplish. They also filled balloons with flour to serve as homemade stress balls. 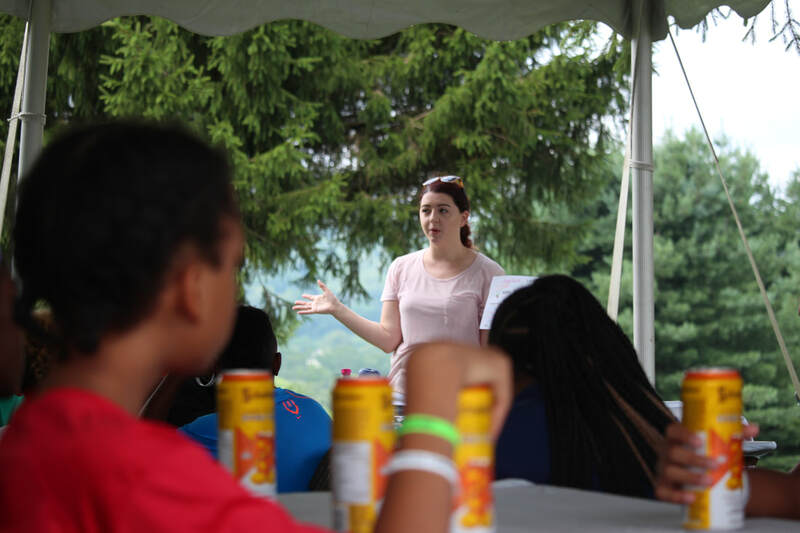 Angela Terenzioa, center, spoke about the effects of trauma and how it can impact mental health to children at the Mel Blount summer youth camp on July 14, 2017. "I love working with youth, they are our future." Terenzio said. "I think it's important to talk about trauma too, especially with Second Chance, all of our kids are in care and all of them have experience with trauma as well"
After the education sessions, campers heard from Mike Brown of ELITE Teams. Brown has helped individuals get out of gangs located in El Salvador, Costa Rica and Honduras and improve their lives. Brown has since set up vocational opportunities and worked with local governments in these countries and has seen success in changing the lives of former gang members. During his speech, he focused on worth and exposing weaknesses to build strength. "Our goal is to empower young people," Brown said. "We want to unify groups of people like this, to bring everybody together and unify their strengths." Following the speech, campers had to opportunity to view the Pittsburgh Steeler's Hall of Fame Bus and partake in hayrides, a drum workshop, basketball tournaments and play on the ropes courses. Since the transition from a daily youth camp for young men to a full day summer camp event, the Mel Blount Youth Summit has reached more children in the past year than it did in the previous 25.